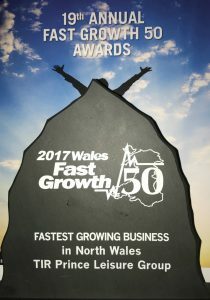 We are extremely happy to announce that the Tir Prince Leisure Group have won The Fast Growth 50 Award For The Fastest Growing Business In North Wales 2017. In its 19th year, the Fast Growth 50 awards aim to highlight the range of entrepreneurial talent throughout Wales from a diverse range of industries. Sponsored by Barclays, Flybe, The Welsh Government and more, it has quickly become the award that businesses throughout Wales aspire to. The awards first launched in 1999 and have quickly gained traction and support throughout Wales, with 2017 seeing a record number of entries. When looking at the 50 fastest growing businesses in Wales, it is clear to see the positive impacts these companies provide; from creating 34,000 jobs to generating an estimated £18 billion turnover annually, the domino effect of this can be seen when turnover is spent and filtered into the local area, benefiting Wales as a whole. The list of 50 is collated by Professor Dylan Jones-Evans who founded the awards in 1999. Having a wide range of business experience such as serving on the Business Advisory Panel for the Secretary of State for Wales to being awarded an OBE in 2013 in the Queen’s Birthday Honours list, he has shown his passion for business. The Tir Prince Leisure Group has worked to provide entertainment supporting the North Wales tourism industry, from harness racing, amusement parks and most recently Llandudno Pier. Tir Prince was set up over 20 years ago by Billy Williams, father of current Tir Prince Director Adam Williams, starting off as a derelict piece of land. Having been awarded The Fastest Growing Business in North Wales 2017 shows the dedication and passion put into building up each attraction. The Llandudno Pier is a symbol of the area, with a variety of entertainment spread across its 1234ft length. Since the purchase of the pier, there has been continual maintenance and innovation to ensure that the pier remains the heart of Llandudno. The Fast Growth 50 List is the perfect showcase of the talent and hard work throughout Welsh entrepreneurs who contribute to the experience, employability and wealth of Wales – We are over the moon to be a part of it!